That is so cute and such a great message. Yes, it's the messages and art work make this series a hit. Thanks Vicki - super cute. That last picture you shared is such a perfectly drawn "Oh no, I forgot something really important!" face. Just looking at it almost stresses me out. LOL! I love this series! 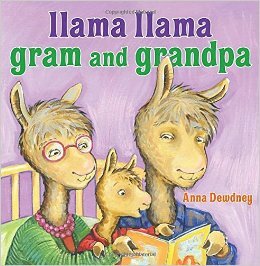 I had Llama Llama Red Pajama and Llama Llama Mad at Mama practically memorized for a long time. This looks like a wonderful addition to the series. I love that it tackles 2 issues - a night away and forgetting something important. Katherine, those are two of our favorites as well, and my granddaughter has the little fuzzy llama stuffed animal with red pjs as well. This looks like an adorable series! Thanks for sharing this darling book, Diane. You are welcome. This is such a fun series for preschool 1-5 year olds - maybe a bit older. Terra, the art work is so fun as well. This sounds like a great book, especially with life's moments being addressed so gently. exactly Denise, and he's so darn cute too.